Executives say it's time for investors to focus on two new metrics to judge the streamer's growth progress. For the past few years, Netflix (NASDAQ:NFLX) has stressed two metrics that management said best described their progress in growing the streaming business. Rather than focusing on traditional figures like earnings and revenue, CEO Reed Hastings and his team emphasized subscriber gains and profitability in the core U.S. market. Improvements in these areas have been impressive. Last year the company boosted its annual membership growth pace by adding 19 million new subscribers -- up from 17.4 million in 2015. Contribution margin in the maturing U.S. market, meanwhile, jumped to 36% from 33% in the prior year and 27% in 2014 . But now that its global expansion initiative is done -- and with subscriber gains slowing -- Netflix says these figures should take a backseat in investors' minds as they focus on overall revenue growth and global operating margins. Let's look at the prospects around each metric. Sales growth last quarter came in at 35% to mark a step down from the five-year high the company set in the prior quarter. Yet despite a big slowdown in subscriber gains (Netflix added 4.95 million new members compared to 6.74 million a year ago) revenue gains hardly fell at all. NFLX Revenue (Quarterly YoY Growth) data by YCharts. That's mainly a byproduct of the fee hike that Netflix announced last year and, to a smaller extent, the migration of some users onto premium high-definition streaming plans. These trends are pushing average revenue per user higher right now, but as the year progresses, revenue growth should start to line up with overall subscriber gains. Next quarter, executives are projecting a 35% slowdown in member gains compared to the prior quarter, but streaming revenue gains are forecast to drop just 11%. 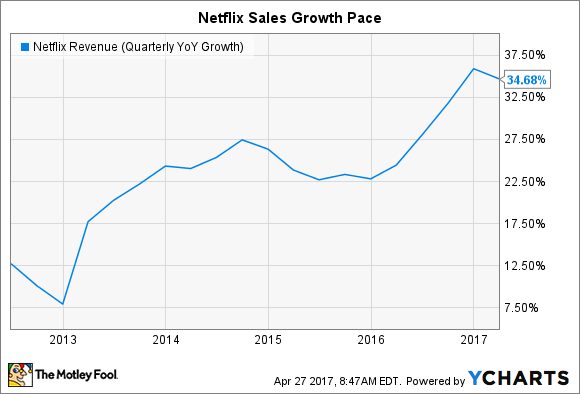 Zooming out a bit, Netflix expects to grow its total streaming revenue by 36% through the first half of 2017 to keep roughly on pace with the 35% total gain it enjoyed through the full 2016 fiscal year. Netflix has for years been promising to begin generating "material" global profits beginning in 2017. That's because, up until this, point management has been directing all excess earnings generated in the U.S. market toward its international expansion. With the global push behind it, and with this past quarter marking the first time that non-U.S. markets as a group produced a profit, the streaming giant can finally start cashing in on its prime industry position. 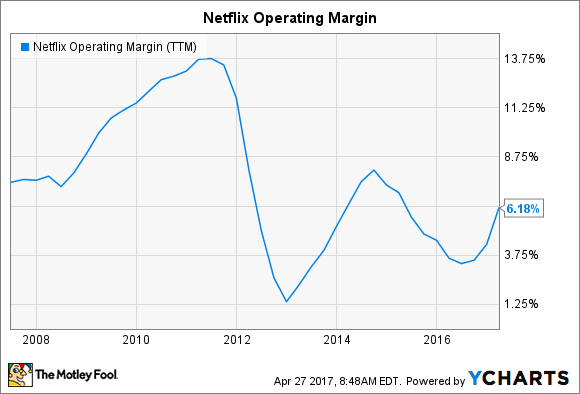 NFLX Operating Margin (TTM) data by YCharts. Netflix backed up its vague 2017 profit promise with a hard forecast, saying it expects to nearly double its global operating margin from the 4% mark it's been stuck at since 2014 to about 7% this year. "From here," Hastings told investors, "we will seek to steadily increase revenue and operating margin as we balance growth and profitability." Heavy content spending remains a big priority, so investors shouldn't count on the company racing back to the double-digit profitability it enjoyed when it was a DVD-only business. "We are in no rush to push margins up too quickly," according to Hastings, "as we want to ensure we are investing aggressively enough to continue to lead internet TV around the world." Still, the company's experience in the U.S. market suggests that it could book significant profit growth over the coming years while soaking up global market share. After all, U.S. contribution margin has steadily improved toward 40% despite a huge increase in content and tech development spending. At the same time, annual subscriber gains held steady at around 6 million in this maturing market before dropping to 5 million last year as Netflix raised prices on its user base. If international markets, as a group, follow that basic path, management and investors would likely be delighted since there will be solid revenue gains in addition to improving profitability.